Covington Planter is proud to begin celebrating our 100th anniversary in the year 2011. Combined with our sister company, Cole Planter, we are the oldest planting equipment manufacturer in the United States, and Covington has continuously and proudly produced quality planters since 1911. To this day, each piece of equipment is hand fabricated on some of the same machines and cast in the same molds as those that were used in the 1930s. We ensure that each piece is as sturdy and reliable today as it was back then. 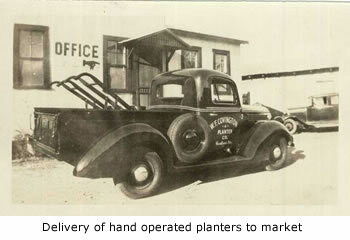 Covington Planter Company was founded in 1911 by Will Frank Covington, Sr. The first plant was located in Headland, Alabama near the railway station. Covington began his business making mule drawn planter implements during the reign of cotton in the South. 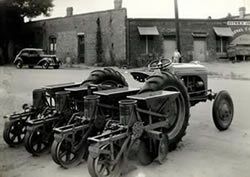 Just prior to World War II the company began to develop planters adapted for tractor power (still designated in our part numbers as “TP”). Many of the old Covington planters are on display at the Alabama Agricultural Museum in Dothan and at the company’s headquarters in Albany. 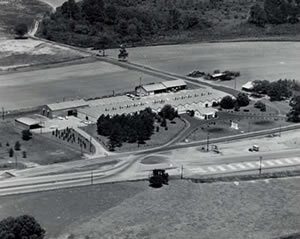 By the end of World War II the little company began to outgrow its Headland facility, and it was in need of expansion. The company purchased a 20 acre site in Dothan, Alabama. Along with a new factory, the company gained a large proving ground to test its products. By then the work force had jumped to almost 100 people and Mr. Covington’s son Frank Jr. and son-in-law Graham Carson had joined the firm. Throughout the next 35 years the Covington Planter Company expanded its reach throughout the southern states, into the Midwest, and as far away as Guatemala. Almost forty years later, following Frank Covington Jr.’s death, Covington Planter Company moved to its current facility in Albany, Georgia under the leadership of Mark Pirrung. The planters continue to be produced in the proven classic Covington design with important improvements to keep the product up to date yet honest to its tried and true design. Covington today has over 225 dealers and distributors throughout the United States and as far away as Australia. We have always and will continue to be proud to support with caring appreciation our loyal customers who have helped make us what we are today. Click here to view our Press Release about our 100th year Anniversary. 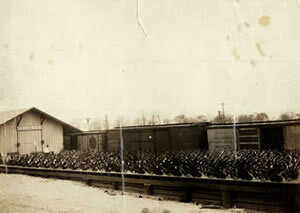 Planters on the shipping dock in Headland prior to World War II ready to be loaded onto rail cars. Demand for mule-drawn planters was obviously strong. 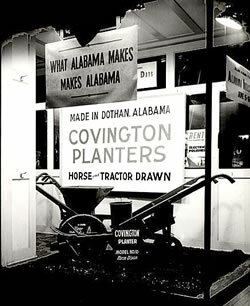 "What Alabama Makes, Makes Alabama"
Covington Planter at an Alabama trade show selling "horse & tractor drawn" planters.